Sometimes, people come to me asking if their dog is a dangerous or “red zone dog.” The reality is, all dogs can bite and would in the wrong situation. Some dogs, however, are far more dangerous than others. As a behavior consultant who loves working with tough, marginal dogs, I see a lot of scary dogs. When I worked at the fourth largest animal shelter in the U.S., we saw several each week. I have taken a lot of time to study dog behavior so that I feel (relatively) comfortable assessing and training dangerous dogs. If you’re worried about your dog’s behavior, consider purchasing our e-book, Practical Solutions for Aggressive Dogs. It’s affordable and thorough! What is a Red Zone Dog? The term “red zone dog” is not a term I like. Articles that talk about red zone dogs sometimes use words like “dark, evil, or psycho.” When I say “red zone dog,” I mean a dog that is dangerous. Red zone dog means different things for different people. If you think that your dog is dangerous and you think he’s too risky for you, your life, and your family, then he’s a red zone dog to you. I think that’s legitimate. Like with most things aggression-related, there aren’t really hard-and-fast rules for determining how dangerous an aggressive dog is. For example, my own dog Barley will growl if other dogs approach his food bowl. Since we don’t have another dog, this isn’t a big deal at all to us. But in a different home, his resource guarding could quickly escalate to a more serious problem. That said, there are a series of questions that I like to ask people when trying to determine how serious an aggression case is. Many of these questions are derived from Michael Shikashio’s Aggression A-Z Course. I created this questionnaire to get a grasp on how risky a case was, using a combination of my experience in the animal shelter and in homes (and drawing on the wisdom of others). The more questions that a person answers “yes” to, the more serious the case (and the more dangerous the dog). PS – Trainers, feel free to use the PDF scoresheet for your own business. Just please don’t remove my logo. Has your dog bitten anyone? The more bites, the more serious the case, in general. Please read about the bite scale to learn more about why serious bites are a more serious concern. Did that bite break skin? Did that bite require medical attention? Was that bite to a person’s torso or face? Has your dog caused damage to another dog? A useful metric here is the bite-to-fight ratio, based on how many squabbles your dog has gotten into versus how many times your dog has actually bitten another dog. The more often a fight results in a bite, the worse. Do you have an active social life that could impact your ability to manage your dog’s behavior? For example, do you have people over frequently or often need a dogsitter due to travel? Does your living situation make it harder to prevent your dog’s aggression? For example, do you live in an apartment where you must walk your dog through narrow hallways past stranger or other dogs? Or does your dog “have issues with” your neighbors and your HOA doesn’t allow fences? Or does your roommate frequently leave the back gate open? Do you not have the time to train your dog? Do you not have the energy to train your dog? Do you not have the money to pay for training and/or medication for your dog? Does your dog frequently bark at minor disturbances, startle at noises, pace, whine, drool, or otherwise appear restless and anxious? Is your dog large and/or powerful? Have you had your dog for a short period of time? Was your dog raised in an environment that lacked appropriate socialization opportunities (such as puppy mills, as a stray, in a neglectful home, or a dog fighting ring)? Has your dog already seen a trainer who is skilled in dealing with aggression cases? 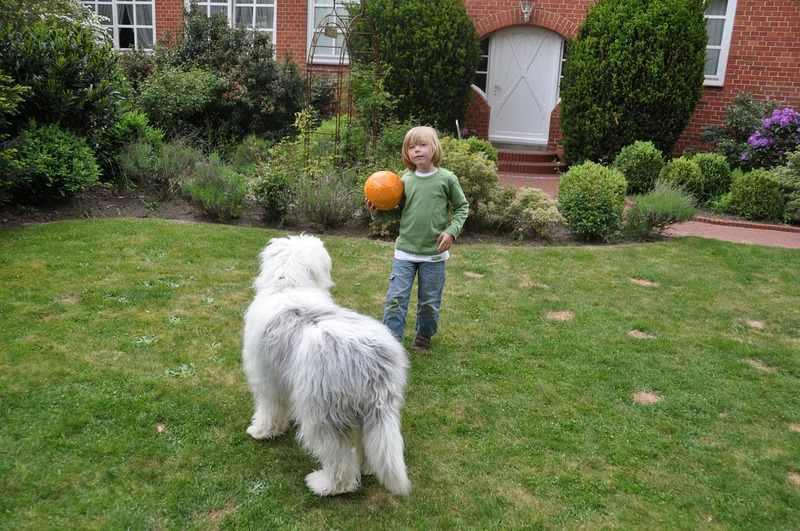 Does your dog lack basic obedience training? In other words, is your dog unable to respond to basic cues such as sit, stay, and leave it? It’s ok if you taught your dog this at home, we just want to know if your dog is able to respond to any verbal cues. Would you describe your dog as generally poorly behaved? This is different from obedience. Some dogs don’t know how to sit on cue, but are still polite and gentle around the home. Does your dog’s aggression seem unpredictable (you’re not sure what the triggers are or the thresholds seem inconsistent)? Is the behavior happening frequently (more than once per month)? Does your dog seem to react to a lot of different triggers? Is the aggression getting worse? Does your dog not give clear warnings prior to aggression? Does your dog take a long time to “calm down” after an incident? Is the aggression directed at something that you’ll have a hard time avoiding (like a family member)? 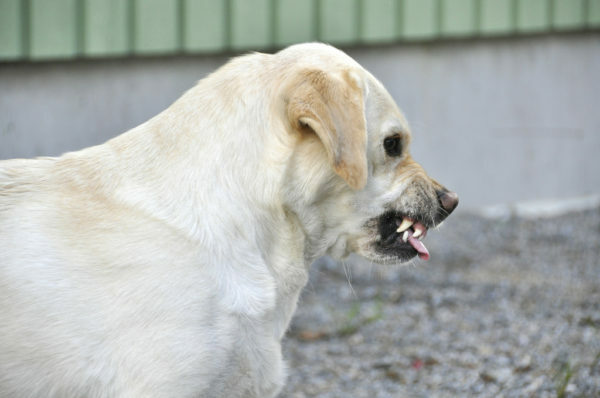 Does your dog have any relatives that also exhibit aggressive behavior? Given the choice, would your dog rather fight than flee? Has the aggression been going on for a while? Keep score and tally up your dog’s behavior. As I said, the definition of “red zone dog” is based on your own comfort and skill level. However, these 28 questions are also meant to get at your own ability to manage and control the problem. What Does My Dog’s Score Mean? As a general rule, a dog that scores above five on this scale should probably see a trainer unless those points largely come from the “Family and living situation” section. Then again, if you’re worried enough about your dog’s behavior to read this article, your dog is probably a candidate for training! 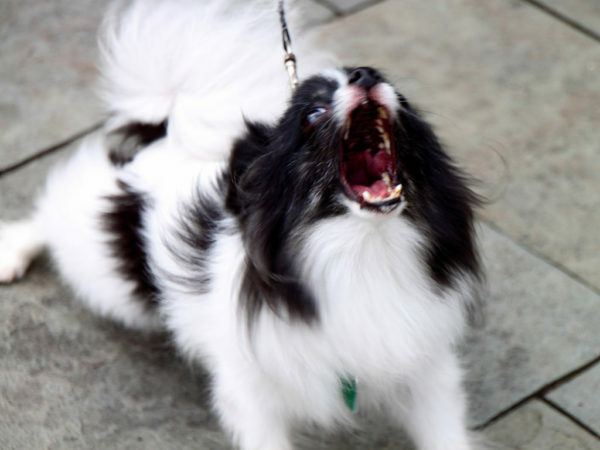 A dog with a score of two or three can still be pretty scary – for example, if I had a young child (1) and a dog who unpredictably (1) and frequently (1) growls (just 3 points), that’s a serious situation! On the flip side, a large (1), anxious (1), untrained (1), new-to-you (1) dog that takes a while to calm down after incidents (1) and is frequently (1) triggered by a lot of things (1), resulting in growling at you (1) is a cause for concern, but arguably a less serious scenario as long as the aggression is low-level and predictable (despite scoring 8 on our scale). A dog that scores above ten on this scale is generally quite concerning and should see a behavior consultant who is well-versed in positive reinforcement based training and aggression. Reach out to me and I’ll help you find someone good! Most homes are not well-suited to keeping dogs that score above ten on this scale. A dog that scores fifteen, twenty, or more is probably a very serious case indeed. If the bulk of your points come from the “family and living situation” section, rehoming your dog may be a legitimate option. However, it can be a very difficult decision to rehome a potentially dangerous dog. Again, consult with a behavior professional to get their opinion. No matter what your dog’s score is, it’s smart to get help. Send me a copy of your scoresheet at kayla@journeydogtraining.com and I’ll help you come up with a preliminary game plan – for free. Odds are, I’m going to suggest a muzzle at the minimum. Management is always the first step. There are no easy answers with aggressive or red zone dogs. Training, rehoming, or euthanasia are really your only options. Training is hard and doesn’t always work. Rehoming can be risky with dangerous dogs, and not many people are lining up to take on a dangerous new pet. Euthanasia is devastating, but sometimes it’s the only safe option. Why Shouldn’t I Correct My Red-Zone Dog? Well, we’re going to correct the behavior (and the underlying emotions). But we’re not going to administer corrections. 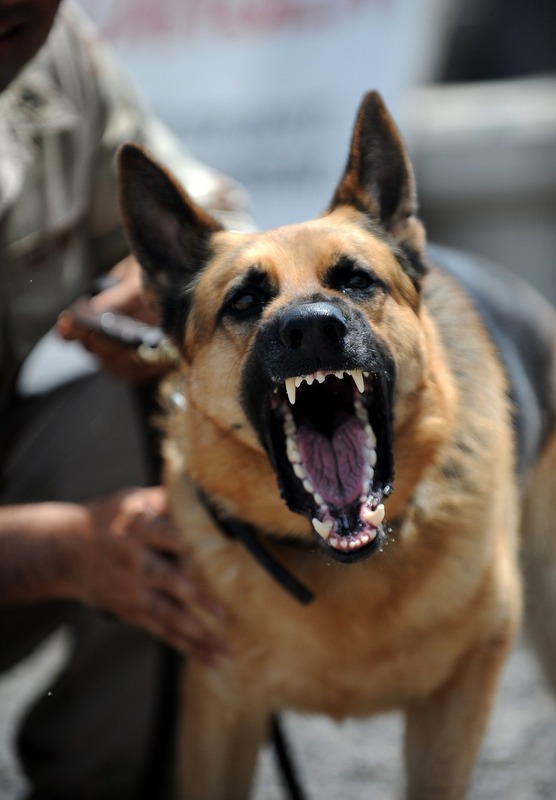 If you want a detailed overview of how I work with aggressive dogs, check out this article. Take it from a dog behavior consultant with years of experience, not a T.V. star, your local obedience trainer, or Joe Schmoe down the street. Preventing problem behaviors through smart management in the short and long term. Catching your dog being good. Teaching your dog the skills he needs to navigate life. If necessary, this also includes counterconditioning to change his emotional responses to adversity. Reacting to aggression with aggression is not a great way to create peace and harmony. Instead, skilled trainers will resort to using counterconditioning to change your dog’s emotional response to his triggers. Before any of that can happen, though, a behavior consultant will help you figure out how to prevent the aggression from happening. Once you’ve got the situation under control and everyone is safe, it’s time to work on counterconditioning. While you teach your dog that his former triggers are actually the signs of treats coming his way, you can also teach him an incompatible coping behavior. I don’t knowingly let him eat food where other dogs might bother him (prevention). I set up training situations where Barley is leashed and muzzled and another dog walks by. Right when Barley notices the other dog, I toss hotdogs into Barley’s bowl. He learns that other dogs coming near his food makes hotdogs rain from the sky. I taught Barley to drop food on cue and run over to touch my hand. He can’t do this while he also bites another dog, so it’s an incompatible coping behavior. I give him lots of treats for complying with this cue! Naomi sees another dog and starts to bark and lunge, snarling and spraying saliva all over. Then we run in the opposite direction, playing a chase game away from the other dog. When we get far enough away, I shower Naomi with treats. I’m right there with you. I keep careful track of my training client’s food and weight. We reduce their meal size to accommodate treats. As far as rewarding your dog for being a jerk, the thing is that punishing your dog for being aggressive is likely to make the problem worse. Feeding your dog is likely to improve your relationship with him and help him calm down. Let’s look at a human example. If I’m in a pissy mood and I start picking at my boyfriend Andrew (usually by yelling at him to turn the music down or getting unreasonably irritated with his driving), he generally has two responses: respond to my aggression with aggression of his own (causing a fight) or being kind and understanding, and offering to cheer me up with ice cream. Is he rewarding me for being a jerk by giving me ice cream? Not really. The ice cream calms me down and makes me feel all warm and fuzzy towards him. You can read more about my dog training methodology here. I also have a big old primary literature kit that goes over the science of different training methods, if you’re into that sort of thing. Let’s be like the kind, understanding, and cheer-you-up version of Andrew with our dogs. Positive reinforcement works, and it’s got none of the nasty fallout potentials of correction-based training. E-collars, prong collars, yelling, physical manipulation, and other forms of correction have been shown to cause aggression in some studies – so let’s not risk it. In short, everyone’s definition of red zone dog is different. This scale can help you get a good idea of how serious your dog’s case is. If you send me an email with a copy of your scoresheet, I’ll give you some free help. Regardless of what you decide to do, reward-based training is a far safer and better bet than using correction-based training, especially with red-zone dogs. I’ve written quite a bit about calming aggressive dogs here if you’d like more of a nitty-gritty training plan on the subject. Kayla, this information is wonderful. I like your human analogies and your pragmatism. It’s important to keep tough conversations in mind – both for safety and also to remind us how high the stakes are. Thanks again. Glad I could help, Lexi. I know how tough this can be. I try to help as much as I can!